We hire NTi Sound Level Meters and STIPA Test Equipment. Originally (1976), NTi were the measurement division of Neutrik the world famous audio and data connector specialists. 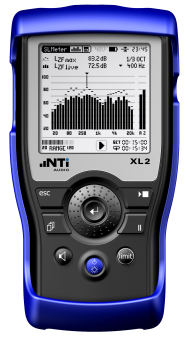 In 2000 they introduced the first handheld analog audio analyser called Minilyzer ML1; which received many International Industry Awards for its outstanding innovation and technology. NTi Audio was formed through a management buyout of the Audio Measurement Division of Neutrik AG.